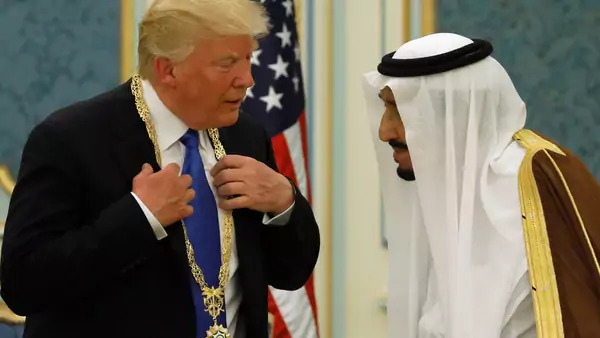 Saudi Arabia's King Salman bin Abdulaziz Al Saud (R) presents U.S. President Donald Trump with the Collar of Abdulaziz Al Saud Medal at the Royal Court in Riyadh (Jonathan Ernst/Reuters). This article was originally published here in Salon on Saturday, May 27, 2017. What is there to be said about President Donald Trump’s visit to Saudi Arabia that has not already been said? That the irony of a president who campaigned in large part on suspicion of Muslims would go to Saudi Arabia was astonishing? That the president shamelessly hawked “beautiful American weapons” to a country already awash in sophisticated arms that have been used to pulverize Yemen, the poorest country in the region, in a war that has become a major human rights disaster? That Trump’s call to arms to fight extremism and terrorism was made in the nation that produced 15 of the 19 9/11 hijackers, with nary a word about how Saudis have contributed to this phenomenon? The oddity of Trump’s visit to Riyadh provided a seemingly endless stream of social media snark, along with more serious criticism of the White House’s approach to the Middle East, which seems based on, well, giving a speech. In fairness, there were hints of strategy to be found in Trump’s 3,400–word address, but instead of the dramatic break from the past that the administration had promised, the White House strategy seems awfully familiar.